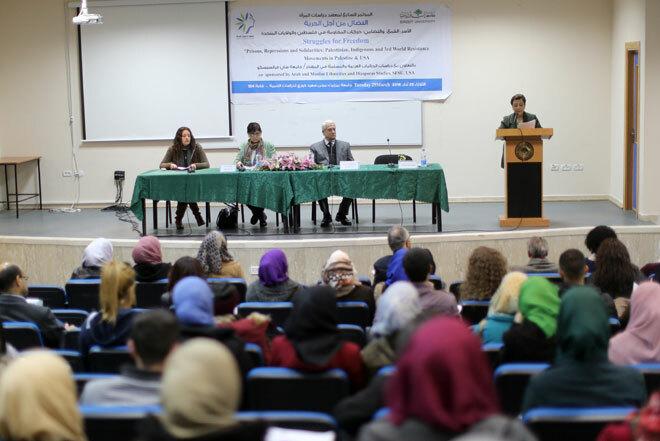 Palestinian, indigenous and Third World liberation struggles were discussed at the 7th annual conference of “Struggles for Freedom” organized by the Institute of Women’s Studies at Birzeit University and the Arab and Muslim Ethnicities and Diasporas Initiative (AMADE). The conference provides a comparative approach of the Indigenous, Black and Puerto Rican liberation movements in the United States and the anti-colonial resistance movement in Palestine, and explores the dynamics of subjugation employed by colonial/racist powers as well as the acts of resistance deployed by Natives, Blacks, Latinos and Palestinians in their freedom struggles. Sessions at the conference were facilitated by Department of English Language and Literature faculty member Rania Jawad, Department of Philosophy and Cultural Studies faculty member Rami Salameh and Assistant Professor of Anthropology Alaa Al Azzeh. Palestinian and international guests analyzed the intersections of colonialism, racism and gender and sexualities that resistance movements have had to confront, discussed ways and modes of resistance developed to combat the oppression of life under colonial racist regimes, and examined strategies of dismantling and disrupting colonization, among them strategies that create an alternative world through solidarity, cooperation, and collectivity that sustains and is sustained by the struggle of freedom. “Birzeit University was able to flourish under the harshest of conditions. Picking its fruit is always a collective effort and the product is extremely nutritious - education was our tool in resistance,” university president Abdel Latif Abu Hijleh said. Institute of Women Studies Director Eileen Kuttab said that the conference’s focus was on the parallels, shared experiences, continuities and ruptures of incarceration as anti-insurgency as well as the counter resistances employed by prisoner movements in Palestine and Third World countries. AMED provides an intellectual home to scholarship and analysis on pertinent issues affecting Arab and Muslim communities. Activists and scholars are engaged in critical and decolonizing work in the field, through documentation, analysis, and skilled pedagogy.